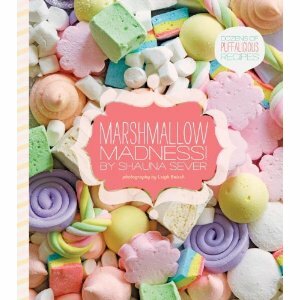 Don't Eat the Paste: Book Review- Marshmallow Madness! If you've ever had a fresh, made from scratch marshmallow, you know the flavor and texture is so different from the store-bought bags that it's like a different food entirely. The fresh one, that's what a marshmallow should be. Shauna Sever starts her book with an introduction to the key ingredients, sugar, gelatin, water, salt, vanilla extract , coating and corn syrup. The corn syrup is used for consistent results in small amounts, substitutes can be tries and she suggests a few. I used an organic non-HFCS type that has worked well for me in the past, golden syrup would probably work as well. The coatings are the powders you cover the finished marshmallows in to keep them from sticking. Then the tools, including tips on how to calibrate your candy thermometer and why you need a stand mixer. She also explains how the recipes are broken down, starting with the "bloom" which is the process of blooming the gelatin, the syrup, which is what the candy is made from, and the mallowing, which is where you start mixing your bloom and syrup into a gorgeous mass of marshmallows, and the ingredients you might mix in at this point. Then you get to the good stuff. The recipes. Almost all the recipes have variations listed as well. She starts with nice, basic marshmallows. Vanilla, chocolate and filled marshmallows. She also includes a vegan recipe and one that uses egg white meringue. The meringue is my favorite for it's light, fluffy incredible texture. Also a recipe for the best marshmallow creme ever. It's the recipe I'll use most since it's very simple to make, and tastes amazing. She suggests it for frostings and fillings. I recommend it with peanut butter on crackers. She also has 2 recipes for graham crackers, one of them is gluten free and vegan. The next chapter is fruity marshmallows which use purees, juices and essential oils for true to the original flavors. These can get some coloring from the juices used and would be perfect for parties. Tips for shapes explains how to make very attractive marshmallows like the twisted ropes on the cover. Happy Hour as alcohol infused treats for your next adult get together. Inspired by classic drinks with tips for mallowing with alcohol in the mix. Then my favorite chapter. Gourmet treats. These are the marshmallow recipes that made me think of friends who would appreciate them, and this is the chapter that inspired my daughter. I like the salted ones, caramel and peanut too much. She likes the maple-bacon and the spicy Aztec chocolate. She gives tips for gift giving in this chapter. Kids in a Candy Store are the brightly colored, candy flavored puffs that will thrill children with fun ideas for presentation. The last chapter is full of recipes that use marshmallows, rice crispy treats, hot chocolate, a spicy hot vanilla, and a wonderful s'more cupcake that's toasted with a kitchen torch. If you've had an interest in making your own marshmallows, I really recommend this book. It's gorgeous, with a softly padded cover, bright pastel illustrations and lots of full color photos. It also contains a lot of great ideas that can be a starter point to your own creations. Check out Quirk Books on Facebook for free downloadable recipe cards from this book. I received a copy of Marshmallow Madness free from the publisher for review purposes.